The Supreme Court has a busy week in prospect with three full appeals to be heard. On Monday and Tuesday Lords Hope, Saville and Walker, Lady Hale and Lord Kerr will hear Gisda Cyf v Barratt. 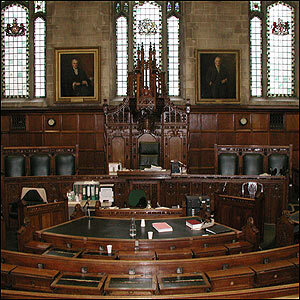 The case was initially listed for a hearing in January but the parties agreed an adjournment – see here. The dispute involves the termination of the respondent’s employment and ultimately turns on when the effective date of termination (and therefore the beginning of the three month time limit for bringing an unfair dismissal claim) should be: when the letter was sent (as Lloyd LJ argued in his dissent in the Court of Appeal), when it was received; or when it was read (as the courts below all found). Our case preview is here and the case details can be found on the Supreme Court website here. Meanwhile in Courtroom 2 Lords Rodger, Brown, Mance, Collins and Sir John Dyson will hear R v Maxwell. The appellant, Maxwell was convicted of robbery and murder in 1998 and sentenced to 18 years imprisonment. His conviction was subsequently quashed by the Court of Appeal in November 2008, after an investigation by the Criminal Cases Review Commission revealed serious police and prosecutorial misbehaviour that rendered the conviction unsafe. However, the Court of Appeal also ordered a retrial and the Supreme Court must now decide whether it is entitled to do so having already quashed a conviction on these grounds. The Court of Appeal judgment remains subject to reporting restrictions. Our case preview is here and the case details are on the Supreme Court website here. On Wednesday and Thursday Lords Hope, Saville, Walker, Collins and Clarke will hear Holland v The Commissioners for HMRC . The Supreme Court will decide whether the respondent is liable to pay the outstanding tax liability of a group of companies under section 212 of the Insolvency Act 1996, by virtue of his being a de facto director of a company that was the corporate director of the companies in question. The case details can be found on the Supreme Court website here. The Judicial Committee of the Privy Council will also hear one appeal this week. Sitting on Wednesday and Thursday Lords Rodger, Brown, Mance, Kerr and Lady Hale will hear Noel Campbell v The Queen (Jamaica). There are no judgments announced for hand down in the Supreme Court this week, but no fewer than seven will be handed down in the Privy Council on Wednesday. The cases are: (i) Razcoomer Moodoosoodun v The State of Mauritius; (ii) Gangasingh Aubeeluck v The State of Mauritius; (iii) Marie Jean Mirbel v The State of Mauritius; (iv) Charmaine Bernard v Ramesh Seebalack; (v) Kirk Gordon v The Queen; (vi) Rosalind Ramroop v John Ismail & Lall Heerasingh; and (vii) Seeromani Maraj-Naraynsingh v The Attorney General of Trinidad & Tobago and the Director of Public Prosecutions. Leave a reply on "In the Supreme Court w/c 19 July 2010"